LAS VEGAS, NV--(Marketwire - April 29, 2008) - Cisco (NASDAQ: CSCO) spotlighted Adena Health System's innovative use of telemedicine video conferencing to deliver expert neonatal care in a media roundtable with Jayshree Ullal, Cisco senior vice president of data center, switching and services, at the Interop 2008 Conference today. Adena Health System, a leading healthcare organization that serves the residents of a 10-county region in southern Ohio, deployed a video conferencing system based on a Cisco® Campus Communications Fabric framework. With this solution, Adena Health System can now link its main facility, Adena Regional Medical Center, to Nationwide Children's Hospital in Columbus, Ohio, as part of an ongoing initiative to provide a higher level of care for patients. 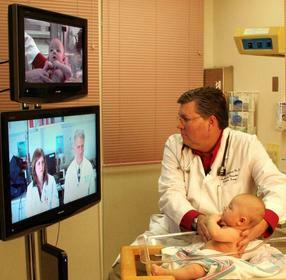 Adena Health System's innovative telemedicine initiative began in 2006 when it connected its neonatal department with Nationwide Children's Hospital's neonatal intensive care unit via a video conferencing system. While Adena Regional Medical Center provides outstanding care for mothers and newborns, it has limited access to physicians specializing in neonatal critical care. For that reason, Adena doctors typically had little choice but to transfer any newborn that might need critical care to Nationwide Children's Hospital, located 70 miles north in Columbus. In fact, Adena typically transferred more newborns to Children's Hospital than any other provider outside Columbus. These transfers could place significant strain on families and newborn patients. With the telemedicine video conferencing solution based on Cisco Catalyst 6500, 4500 and 3750 Series Switches, specialists at Nationwide Children's Hospital have the opportunity to evaluate newborns with their own eyes and make more accurate diagnoses, share test results and imaging films, and fully participate in treatment by consulting with Adena doctors as if they were standing in the same room. For Adena families, it means more advanced care closer to home, no long commutes for visiting family and friends, and fewer newborns that need to be transferred 70 miles away. In just its first year of operation, the project helped cut the number of patients transferred from Adena to Nationwide Children's Hospital by 50 percent, from 70 to 35 newborns. "There are many benefits and advantages the telemedicine initiative has brought to Adena Health System, and the most important one is that we can now provide a higher level of care for our patients who need help the most," said Marcus Bost, chief information officer for Adena Health System. "The Cisco integrated network provides a highly secure and high-performing foundation that we are confident will support our high-definition video conferencing system as well as our large clinical imaging files and other business-critical medical applications. Furthermore, it simplified operations and management when we standardized on Cisco Catalyst switches." As the Adena Health System focuses on enhancing patient care, delivering cost savings and increasing productivity, the company is exploring more advanced uses of video. One area it is exploring is the inclusion of virtual classrooms in the major education campus being constructed near the medical center. The campus will comprise a four-year nursing school in collaboration with Wright State University in Dayton, Ohio, as well as all other Adena educational partners, including Ohio University and Hocking College. In these virtual classrooms, physicians from anywhere in the world will use a telemedicine application and the Cisco integrated network to teach remote students. The new facility will also support video recording and broadcasting over the Cisco integrated network. Businesses are making video applications such as desktop video, surveillance, telepresence and digital signage an integral part of communications, collaboration and business processes. To help these companies, Cisco is demonstrating how the Campus Communications Fabric framework delivers the Video-Ready Campus for delivering a consistent, high-quality user experience and simplified operations as video adoption increases. "Cisco has put great emphasis in enhancing our Catalyst Series Switches to allow businesses of all sizes to deploy Video-Ready Campus networks," said Marie Hattar, vice president of network systems and security for Cisco. "We believe that video applications will drive business innovations and will help customers such as Adena Health System build a communication and collaboration platform with the capabilities to greatly enhance patient care and customer service." information confidentiality, admission control and threat defense. supported as users and requirements grow. Cisco Catalyst Series Switches are at the center of the Campus Communications Fabric's Video-Ready Campus, a solution that helps customers optimize their video deployments throughout their organization. For more information please visit www.cisco.com/go/ccf. Cisco, the Cisco logo, Cisco Systems and Catalyst are registered trademarks or trademarks of Cisco Systems, Inc. and/or its affiliates in the United States and certain other countries. All other trademarks mentioned in this document are the property of their respective owners. The use of the word partner does not imply a partnership relationship between Cisco and any other company. This document is Cisco Public Information.